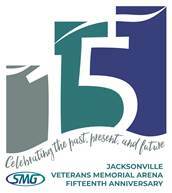 The Jacksonville Veterans Memorial Arena (JVMA) marks its 15-year anniversary and announced plans to celebrate the milestone with a series of special events and contests. The JVMA replaced the Veterans Memorial Coliseum, which was the city’s primary concert venue. The doors opened for its first performance on November 21, 2003 with Elton John. Since then, more than 7.2 million patrons have attended 1,607 events. JVMA has presented an impressive 77 sold out concerts in its 15 year history. One of the contests planned for the year-long celebration is the “15 for 15” Contest. JVMA will be announcing monthly ticket giveaways on social media for 15 of the hottest events of the year including Cher, P!NK, Blake Shelton, Elton John, KISS, Twenty One Pilots, and New Kids on the Block, with more events to be announced throughout the year.